The March 2013 death of Hugo Chávez has unleashed chaos in Venezuela, with government officials and citizens alike struggling to come to grips with the uncertainties of the country’s political future. Currents of political instability have increased steadily since news of Chávez’s illness became public. But the political icon’s death and the recent election of his heir and VP, Nicolás Maduro (who won by a margin of less than two percentage points) have further stoked the ideological flames among those opposed to Chavismo. Since the election, supporters of Maduro's opponent, Henrique Capriles, have staged massive demonstrations to demand a vote recount in Caracas and other major cities, despite efforts by the government and national guard to the block their actions. It has been reported that between six and eight people have died in these protests and several buildings have been set fire by extreme factions of the opposition, though these reports have not been confirmed. All of these events have had adverse effects on citizen and social media users. In just six weeks since Chávez’s death, two social media users have been arrested on charges of posting information and images deemed “destabilizing” to the country. On election day, the Internet was briefly shut down throughout most of the country. And today, social network users are facing threats to their employment status, as authorities search profiles for signs of political affiliation that have, in several cases, resulted in users losing their jobs. 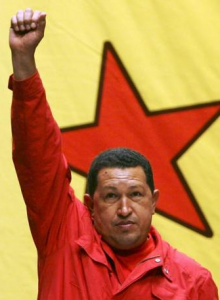 The fourteen-year mandate of President Chávez was marked by controversy and divergence of views between different sectors within and outside the country. The framework of a so-called “ideological battle,” has pitted government supporters and critics against one another, though it shows few signs of real, critical debate. As the battle has been waged in traditional media and on the streets, it also has moved to social networks. The opposition believes itself to be the owner of social networking. They think Twitter and Facebook is theirs. We are fighting the battle and we are 7 million militants who will have Twitter. Cabello noted that they would “assault social networks to counter the views expressed by [their] opponents.” Many government officials now have Twitter accounts and use them to communicate important information to citizens. Different political parties, candidates and NGOs also use Twitter to interact with followers. This has proven effective in Venezuela, which has high numbers of social network users relative to its neighbors, and globally ranks thirteenth for its number of Twitter users. In April 2010, the government announced the creation of the “communicational guerrilla“, a group of citizens employed to “fight the ideological battle” in independent and mainstream media and on the Internet. So today, the battle is being fought in hashtags: keyword positioning in support of and against the government is a constant, and there are, on both sides, users dedicated to monitoring specific keywords to respond, often aggressively, to those expressing controversial opinions. It is widely believed that the Chávez government was characterized by an “excessive” allowance of freedom of expression. Yet during the last six years of his tenure, at least five social network users were arrested, all under similar circumstances: Users with little or no influence on social networks were taken into custody for making politically controversial comments (usually on Twitter) and were charged with “spreading rumors” that caused “instability of the country.” They were held for short detentions, and then released on parole. Since Chávez’s death, there have been two similar arrests. [The law prohibits content that] uses anonymity, encourages and promotes hatred and intolerance for religious, political, gender, racism or xenophobic reasons; incites or promotes and/or justify the crime, constitutes war propaganda, promotes anxiety in the citizenry or alter public order; disowns legitimately constituted authorities; induces murder, incites or encourages disobedience of the existing law, or promotes, justifies or incites public disorder. Passed by executive order and enacted in 2010, the law has not been applied in court thus far. The law also holds Internet Service Providers liable for such content. ISPs can face fines of “up to 4% of their gross income from fiscal year prior to the infringement.” But there is no evidence that the law is being applied; users report that censored websites are only being blocked by government-run ISP CANTV, but not by privately-owned providers. A different formula has been used to push back against influential online critics of the government and party. A collective user group known as N33, allegedly comprised of government-supporter hackers (and by some accounts, promoted and financed directly by the government), has a long history of hacking into Twitter, Facebook and email accounts of journalists, activists, politicians, and other high profile figures from the opposition. The group has also been known to issue threats via electronic means and telephone to other well-known figures of digital activism. During the country’s brief presidential campaign cycle this April, both candidates actively used social media and other online platforms, including a web TV channel, to promote their candidacy. Citizen journalists have played a key role in counter balancing the information transmitted through traditional channels. They have uncovered abuses and acts of violence in different parts of the country and established alternate spaces for public opinion. Initiatives like UstedAbuso (You Abused) allowed users to report on violations of electoral law during the campaign. Personal accounts like that of Eugenio Martinez (@puzkas), a journalist specializing in electoral coverage, became essential to following the pulse of the country in recent months. Luis Carlos Diaz and Naky Soto created a “live feed” on YouTube (called simply “The Hangout“), where they broadcast several nights a week to discuss the political landscape. The channel has received nearly half a million views. 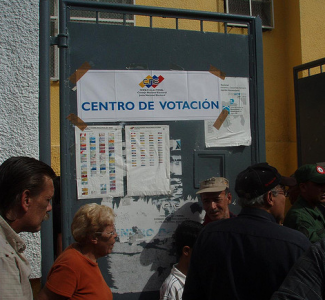 On election day, government power over telecommunications networks was brought to bear in a way that Venezuelans had never seen before: for somewhere between three and twenty minutes late in the day, nearly all Internet connections in the country were blocked. This was relatively easy. In 2010, the government attempted to create a single network access point through state-owned telecommunications company CANTV, which provides over 90% of Internet access in the country. The government’s nearly complete acquisition of CANTV has made it easier for authorities to censor websites deemed illegal (such as quelacreo.com or dollar.nu). When Internet access was blocked for all CANTV subscribersat the end of election day on April 14, the Ministry of Telecommunications explained that authorities blocked the network in an effort to “avoid hacks” to the website of the National Electoral Council. This website was also made ​​inaccessible from foreign IPs for the same reason. Since election day, user profiles on social networks have begun to serve a new purpose: they are helping authorities to identify user political affiliations in order to “debug” public service and private enterprise. Countless complaints of public employees who have lost their jobs after authorities scanned their social network profiles and discovered their political support for the opposition. This has also happened to private sector employees, though for the opposite reasons. 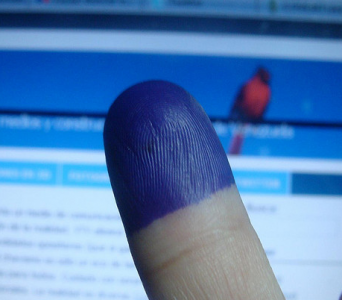 Citizens call this the “resurrection” of the Tascon List, an instrument used in order to filter out those citizens who had signed in 2004 in favor of a recall referendum against President Chávez, and to prevent their recruitment in the public service, which was allegedly eliminated by Chávez himself in 2005 [es]. The beginning of Nicolás Maduro's presidential term has been marked by a strong wave of protests, both online and offline, and rampant rumors and false information transmitted over the Internet. Maduro, Chávez's successor says he plans to follow in his predecessor’s footsteps in media strategy. He has created a Twitter account (@ NicolasMaduro, which was hacked by a Peruvian collective on election day) and has announced that his government will be “firm-handed” in media policy implementation. It remains to be seen whether this policy will affect how Venezuelan citizens make use of the Internet.